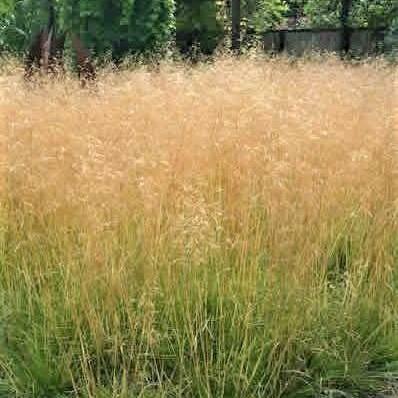 Deschampsia cespitosa ‘Goldtau’ is a clump forming perennial grass cultivar. The tufted foliage is narrow, dark green and usually semi-evergreen. Airy panicles of chartreuse yellow florets with hair like awns appear in summer. They mature into a bronzy-gold color and remain until frost. This cool season grass thrives in shaded or partly sunny moist or wet sites.